I could use some guidance on this one. 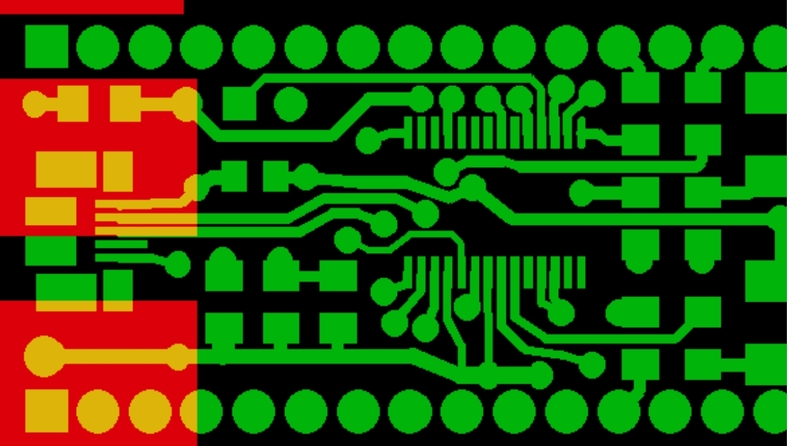 I made a PCB layout using the RIMU PCB layout software, and sent the board to ITEAD Studio. I've done this with several PCB's, and everything has worked out great, and I've been very happy with the PCBs. 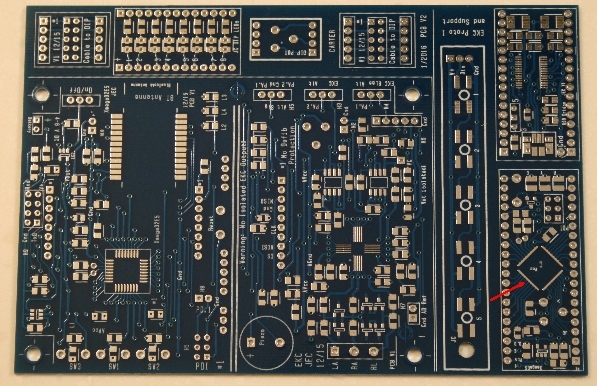 I just received my last submission, and it is a panalized PCB with 8 "boards" on the one submitted board. 7 of the 8 are fine. One of the little boards is an XmegaE5 DIP module, and the layout looks fine on my PC, but on the actual PCB the pads for the micro's pins are all shorted together! The pads for all of the other chips look fine. What happened to this particular chip's pin's pads? 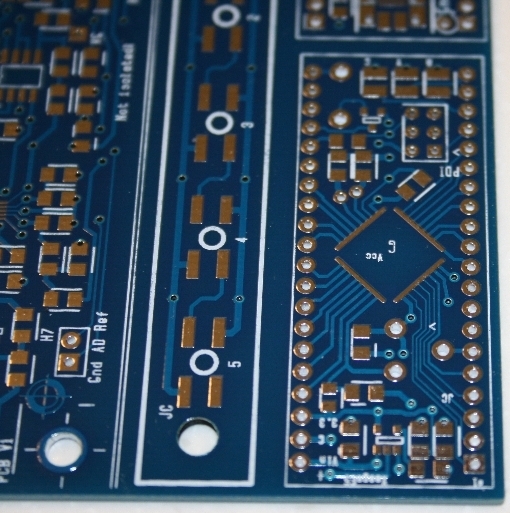 The main project on this PCB is the 8 x 11 cm board, within the ITEAD 10x15 cm board. One can cut the main project's PCB in half and have just the micro / GLCD / wireless part, without the other analog stuff for this particular project, if desired. Being > 10 cm meant that I had to get a 10 x 15 cm PCB from ITEAD Studio. Not a problem, I just filled in the board's boarders with a few other mini-PCBs. Anyway, I've never had this problem with one of my manufactured PCBs. 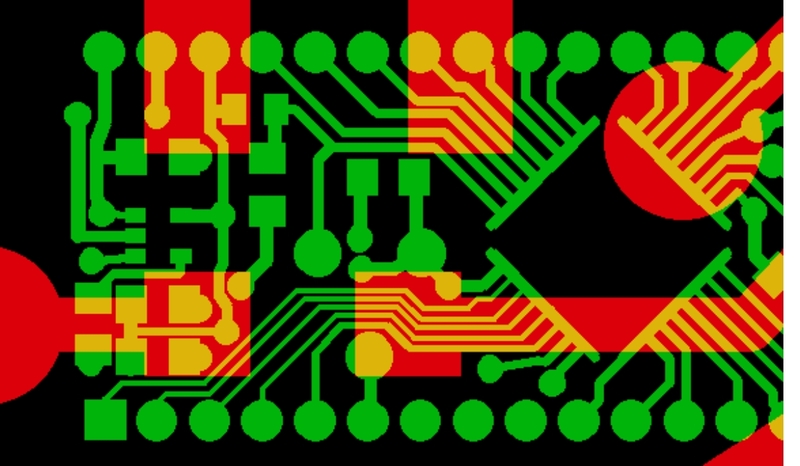 The layout looks fine, the solder mask looks just like the solder mask on the other chips, including the other Xmega on the PCB, and the FDTI chip. Anyone familar with this problem, or have any suggestions? I've submitted a Tech Support ticket, but haven't heard back yet. Does RIMU output Gerber files? I *ALWAYS* check them in one of the many free Gerber viewers. However you do it, probably worth investigating a bit for next time. As you grouped dissimilar designs, perhaps one had a solder mask "pad" size of x, in the table as "Type R". And later, Type R was overridden. Very generic, but I've sen this type of think in CAD layers and document-processing layers and [former life] pen plotter, and similar when combining unrelated material. Looks like they are incorrectly rotated, they are 90 deg off. What's in the gerbers? Who did the panelization? I will have a look at the submitted file with a Gerber viewer later this evening. I had designed the boards separately, and just copy/pasted them to a new blank "board". Of course a scalpel would make the boards still usable for one or 2 boards. Never use rotated chips in RIMU but like everyone says use a Gerber viewer before sending boards out to manufacture. If you want to send me that board's file I can try it out here. I just threw a 32pin chip at 45deg and a few tracks on a board and the Gerber output is correct. Please note that one company wanted me to change some of the defaults outputs for the Gerbers to these just in case it helps. John, thanks for the info. I will zip you the file so you can have a look, and see if anything looks amiss. When I view the composite, panalized board within Rimu it looks fine, and the solder mask looks fine. I've only used my Gerber viewer program once or twice, and it didn't like the Rimu file types, etc., so I will have to relook at how to view the board. I'll also probably give Jim's Gerber viewer (linked) program a try, if the one on my computer still seems reluctant to open the files. Some PCB viewers prefer the use of the old Protel file naming, others don't mind opening the RIMU Gerbers as they are Protel like but with different extensions, just use the "Open with" and then use a Gerber viewer. I have ViewMate but the latest version are just annoying. For PCB companies that need a Protel file name extensions this is what I have used, I'll post it here just in case someone else needs this in the future. I'll have a look at the file you sent me later on today. Well, I like Lee's explaination, but I'll have to think about it some more to figure out why the composite board layout still looks good within the Rimu program. If "Type R" (or whatever), was overwritten, then wouldn't the file look corrupted on Rimu's rendering of the composite file? I also like thesnake's explaination, that on the 45 degree rotated chip the pads are 90 degrees off, i.e. they were not rotated correctly. That's a real problem, as I don't think the Rimu author has provided any updates in a long time, or is in the mood to do so. But, as John mentioned, the other option is to just not use any 45 degree rotated chips. I used Jim's on line Gerber Viewer, wow, it worked first time, without changing any file name extensions. The large red traces are part of the program, I'm guessing if you like the program the paid version removes those. But, the fact of the matter is this, the Gerber Viewer shows the micro's pins all shorted together! The FTDI chip (also shown) and the other Xmega chip (not shown) all look fine on the Gerber Viewer. The scary part is I still don't know what to change within Rimu to have the board work correctly when sent to the PCB manufacturer, except to take everyone's advice above, and make sure I view the submission before sending it. When doing the layout there isn't a clue that the layout is "bad". Got the same view (could not wait...) looks like the pads did not rotate correctly. But this is what I got with my simple PCB, I really have to run now, I'll change the TQFP in your board and see what happens later on.